The top image illustrates kids playing sailball. In the illustration the teams go through the starting line. Blue boat 1 passes between the first and second buoys of the course and waits for blue boat 2 to pass by the first mark to receive a pass. 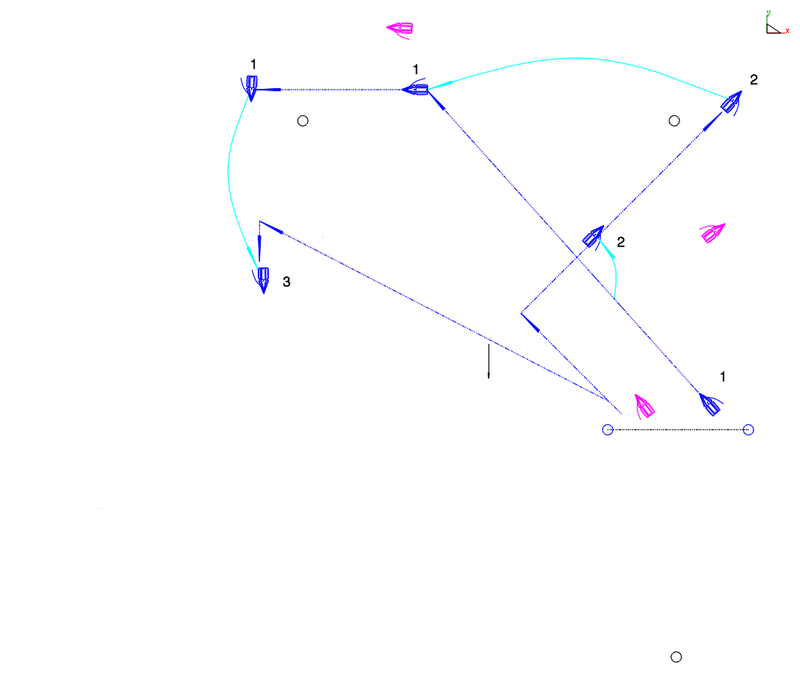 Blue boat 3 goes directly to a position beyond the second mark. The courses of the red boats are not shown. The illustration shows how the frisbee (aerobie) goes around the course but not all the boats don't have to. The first frisbee (aerobie) to cross the finish line wins. In order to call plays it is desirable to provide head-mounted walkie-talkies for the players. Kittihawk20's version of sailing frisbee is only one of many versions of the game. There are two or more teams with two or more boats per team. Each team gets a frisbee (aerobie). All the teams start from home port or go through a starting line. The object is to get the frisbee around the race course ahead of the other teams’. A boat cannot tack while in possession of her team's frisbee (aerobie). She must pass it to a teammate, hand it off to a teammate or throw it in the water for a teammate to pickup. She cannot pick it up herself unless she picks it up after it has been in possession of an opposing team. A boat does not have to go around the race course, but the frisbee (aerobie) does. A frisbee (aerobie) can be picked up by an opposing team’s boat, but she cannot retain possession of it. She must throw it as soon as possible and cannot pass it to a teammate. Check out the University of Michigan's ultimate frisbee approach to sailing frisbee.